The co-op elements of the game aren't particularly strong. Certain duos are more effective than others, and often you can cover your buddy's weaknesses and vice versa. Still, knowing that a co-op partner is at your back makes the game more enjoyable. One co-op aspect that could have really been great is the vehicle sections. The G.I. Joe series is full of awesome vehicles: tanks, snowmobiles, Humvees, etc. When you find them, one partner drives, and the other shoots. Unfortunately, the vehicle controls are a horrid mess. We found this quite disappointing, as the vehicles were a nice change of pace from the endless running and gunning. The difficulty settings are unusual. We played mostly on casual, which meant we never died. When our characters fell, the action went into reddish slow motion, and the characters stood right back up. While it was nice not having to replay anything, it took out much of the sense of accomplishment. At higher difficulties, if both players die, you have to restart the entire level, even if you cleared a checkpoint. What's the point of the checkpoints, then? Not much, as far as I can tell. We went back to playing on casual. Losing a bit of the pride of playing on a harder level wasn't nearly as much of a problem for us as, say, replaying an entire level when the camera gets weird and you both die simultaneously. Easily the most enjoyable part of G.I. Joe is the Enhancement Suits. Throughout the game, you and your partner fill up a gold meter at the top of the screen. When the meter fills, pressing Y activates the power-up. 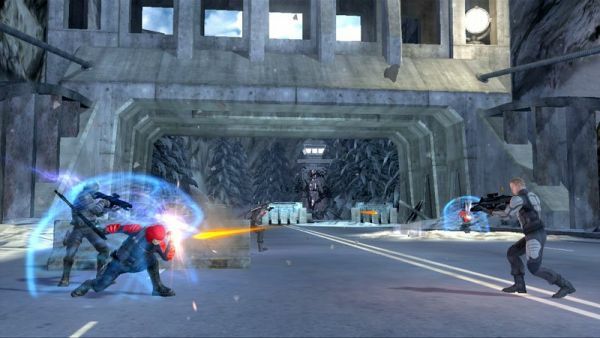 Your character dons the black suits seen in the film, and receives enhanced speed, rate of fire, and more powerful special attacks for a brief time. When the suits are donned, a rousing orchestral arrangement of the theme from the old cartoon blasts out your speakers. It's cheesy, it's over the top, and it's also really fun. G.I. Joe: The Rise of Cobra is a typical movie game. It's passable, gameplay wise, but shows some evidence of being rushed in production. In the end, the appeal of the game is mostly from nostalgia. It plays like a classic game, and includes characters some of us remember from our days of sneaking an action figure in our backpack to play with at recess. To the average gamer, G.I. Joe is a fair game to play when you just need a quick and easy fix. If you are a fan of the G.I. Joe franchise, you'll get a bit more enjoyment out of it. The Co-Op Experience: Players team up by choosing one of 16 playable GI Joe characters in this 3rd person shooter. The game also features 2 player co-op driving sequences. Page created in 0.2197 seconds.